I have no idea why it’s taken me so long to get one of these posts done for Victoria Azarenka. After all, she’s appropriately regarded as one of the best returners in women’s tennis. And I’m a return of serve junkie. Oh well. Better late than never, no? Going into Azarenka’s semifinal match against Ana Ivanovic in Carlsbad yesterday, I thought I was in for a return of serve clinic, since Ivanovic has such a well documented history of struggles with her delivery. I did not expect a tight match at all (let’s remember that the last time these two women played each other, Ivanovic won all of one game). However, yesterday’s match proved to be one-sided for only a set (and really, four of the six games of that opening bagel could’ve gone either way), as the World No. 3 – soon to be No. 2 – ended up booking her ticket to the final via a 6-0, 4-6, 6-3 scoreline. 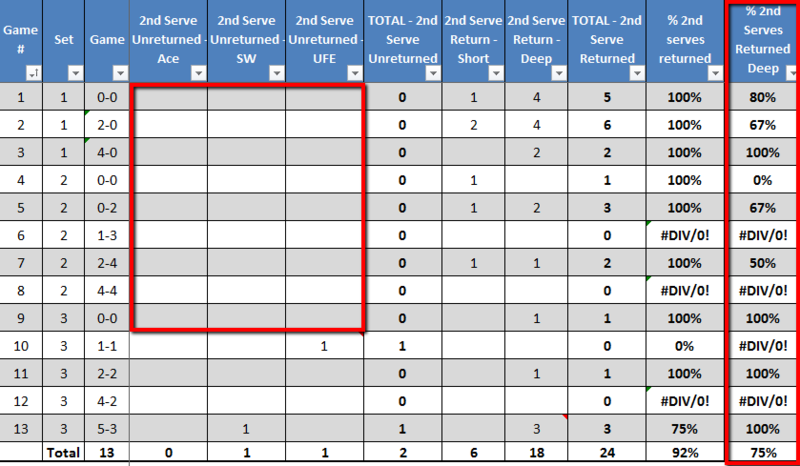 If this is the first time you’ve seen one of these Return of Serve Analysis posts, you can read all about my methodology by clicking here. And if you’re already familiar with this kind of thing, let’s just dive into the data, shall we? – I actually expected Azarenka’s percentage of total returned serves to be higher, honestly. Still, it should be said that Victoria made very few return errors. The free points Ivanovic got with her first serve were almost all due to great deliveries. There’s only so much a returner can do in that kind of situation. – That being said, Azarenka was simply phenomenal in the first set: she returned 24 out of 26 serves that Ivanovic put in play. That’s good for 92%, which is just obscenely great. – Notice the 9 double faults donated by Ivanovic throughout the match. Never a good thing. – The big highlight over the 1st serve Aces and Service Winners columns is there to illustrate just how erratic Ivanovic’s serve is. When it’s on, the former French Open champion becomes extremely dangerous. But I’m pretty sure not even she can anticipate when she’ll go through a good serving spell these days. It’s either feast or famine with her in this department (though it should be said that Ivanovic did recognize the importance of a good slider out wide from the deuce court later in the match – executing consistently was an entirely different issue, though). 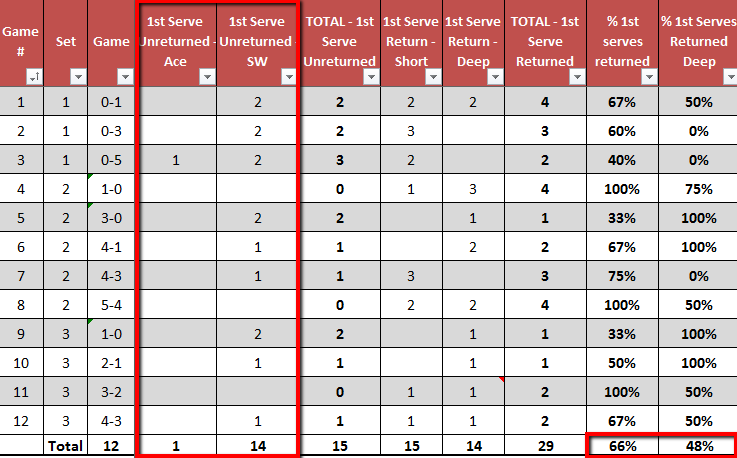 – Notice that in almost half of her service games (6 out of 13), Ana Ivanovic didn’t get a single free point with her first serve. More on this later. – Azarenka’s percentage of 1st serves returned isn’t astonishing, but it’s pretty solid. What’s extremely good is the percentage of those returns she placed deep. To get 6 out of 10 1st serve returns to land deep in your opponent’s court has to help your cause, right? 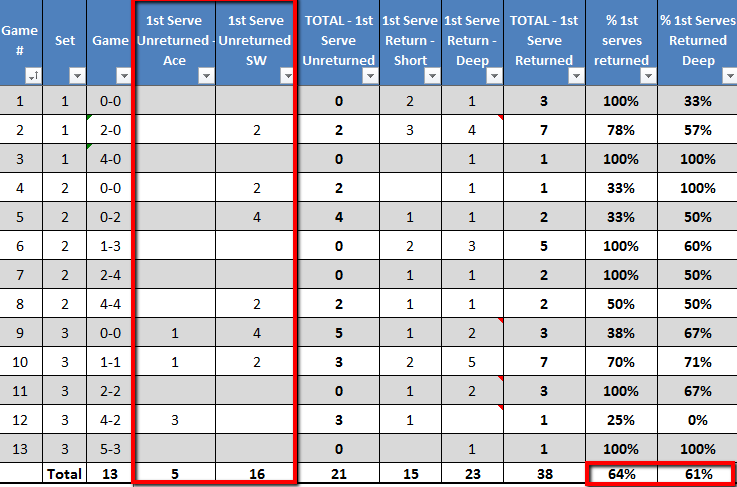 – Azarenka hit 4 first serve return winners (each is noted by the little red triangle on the top right corner of some boxes). That’s pretty remarkable. – This is where Victoria Azarenka makes her millions. Simply put, she barely misses second serve returns. As you can see by the big red highlight, she went two entire sets without missing one. – And to make things more impressive, look at the percentage of those returns that were deep. 75%. 3 out of 4. The crazy thing is, even Azarenka’s short returns are dangerous, because she almost always puts a ton of pace on those. None of this is fun for the server. – In a somewhat ironic twist, the first 2nd server return Azarenka missed all match was a potentially crucial one: on break point at 1-all in the third set. It was a very makeable backhand return, too. – Like Daniela Hantuchova yesterday, Ivanovic produced a rather standard return of serve performance, even though Victoria Azarenka didn’t really have a great serving day (as evidenced by the 7 double faults she contributed to Ivanovic’s returning efforts). – Notice that after playing an extraordinary return game at 5-4 in the second set, Ana Ivanovic never even pushed Azarenka to deuce on her serve. – Remember how Ivanovic didn’t get a single free point with her first serve in 6 out of 13 games? Look at Azarenka: she managed to get at least one free point in all but 3 service games. 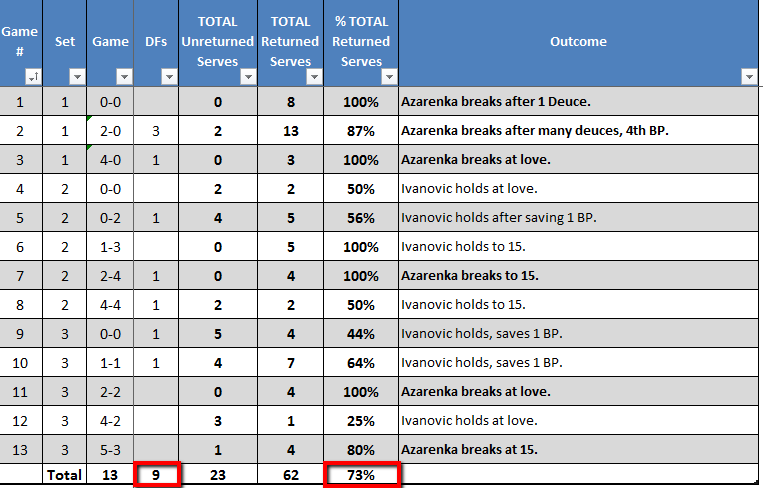 So yes, even if Ivanovic ended up with more total free points (21 to Azarenka’s 15), they were clustered in fewer games. – Also note that Ivanovic gets only 48% of 1st serve returns deep. That translates into more short balls for the server to attack, and it’s not like Ivanovic can excel if she starts rallies from defensive positions. 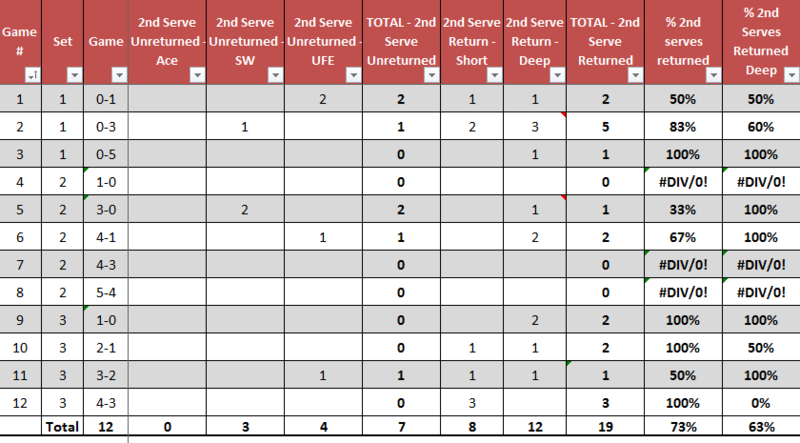 – 7 unreturned second serves don’t sound like much…but they are. You just can’t gift your opponent that many free points. Yes, 3 came off good Azarenka second serves. But 4 were just silly unforced errors. – 63% of second serves returned deep is not bad. Definitely decent, and something to build on. My lasting impression of Ivanovic is that she still can’t find that consistent middle ground of her tennis that the top players are so good at developing. Ana fights and gives it her all, but she can’t help but go through A-level patches of play, only to fall back to a C- level minutes later. And it all starts and ends with her serve. It can be good enough to foil one of the two or three best returners of serve on the WTA, and it can also look amateurish, as she loses control over her toss and chases it around like a club pro. The sad thing is, this phenomenon has been happening for years, and neither Ivanovic nor her army of former coaches has come close to cracking the mystery. One wonders if there is even a solution at this point.